An interesting addition to any collection of Train Tickets. 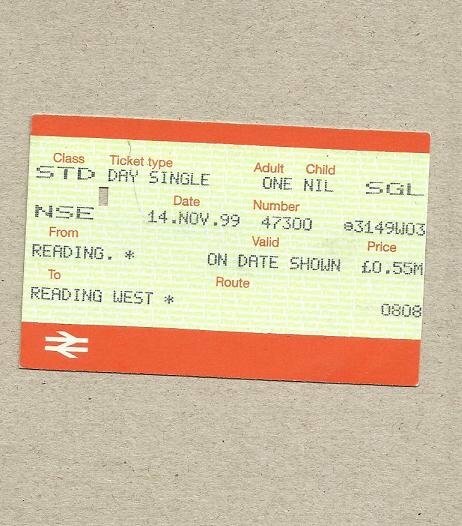 A British Rail Ticket from 1999 which would take the ticket holder from Reading to Reading West within the Berkshire Town. Ticket issued 14 November 1999. There is FREE SHIPPING on this item. All major Credit and Debit Cards using the PayPal Service. The price of all products in my-little-train-station are inclusive of Worldwide shipping. This item will be posted to you direct from Ukraine. The post to UK can take 10 days and to the United States and Canada 14 days. Happy to post to Australia and New Zealand but experience tells us you can wait up to 21 days for your letter or parcel to arrive.